Really? I thought it had the best action scenes of the whole series. That first fight between Batman and Bane was maybe my favorite fight in the series. Surprised to see all the hate on here for Nolan Batman, More people here seem to of liked Avengers of all things. Yeah, I agree with the sentiment that it was on par with Batman Begins. I think it was a good film, but definitely not as good as 2008's The Dark Knight or The Avengers. It felt like there was a lot of filler in the first half of it, and a lack of screen time for both Catwoman and Batman. I understand why Bruce Wayne was away for so long, but still at one point, I was thinking to myself, "Is this a Batman film or a CSI episode?" I really enjoyed the last 40-50 minutes, and the ending but by that point I saw a lot that I felt was boring. Just one man's view. 3.9 out of 5 Cat ears. My thoughts as well. I wish they'd let someone who had respect for Batman make the movies. Thinking back, I was exaggerating a little. He's in it fairly consistently in the final act, so he probably has 30 minutes of screen time. But seriously, he's really not in it as much as you'd think he would be, for what is supposedly a Batman film. As a percentage of the film, he is in it for less than The Dark Knight, and possibly in it for less than Batman Begins (harder to compare, since Batman doesn't exist for the first like hour of Batman Begins). Thinking of the future, I can not but ask the question . . .
"Okay. DC Entertainment and Warner Brothers, you have a hit film on your hands, but what are you going to do next?" a) Since Christian Bale has said he is not coming back, are we going to get another "Batman" film with a different actor? b) or, a JLA film? A JLA film idea is not totally a new idea, as there was a fairly successful animated JL TV series a number of years ago, nor have the major JLA characters not appeared before . . . but . . .
it would offer a chance for those who have not seen the characters to see the characters and a chance to reboot the characters and a chance to spin off all or some of the characters into their own films. "So, DC Entertainment and Warner Brothers what are you going to do next?" They've been wanting to do a JLA film for a while, but I think we need at least three straight same universe films to pull it off, much like the Avengers. Maybe The Flash, Superman, Batman, and Wonder Woman? Absolutely loved it as the final film in a trilogy. Plenty of flashes to Begins and Dark Knight. People complained about the lack of Batman, but the series is as much about Wayne as the costume. In the future though, for all comic book movies, I wish they'd stop rebooting it with origin stories when a new actor signs on. When a new, say, James Bond film comes out with a new actor, they don't 'restart' with showing him in spy academy do they? No. Just continue on. Especially with 'bigger' characters. Even non-comics readers know Batmans origins, Spider Man, etc. I quite enjoyed it and it tied many loose ends together. A few of the plot points and some of the dialogue felt a bit 'by the numbers' in some ways, which is my only detraction of an otherwise satisfying conclusion to the Nolan trilogy. Yeah someone like Joel Schumacher! Yes! I've been wanting a decent Wonder Woman movie for years. 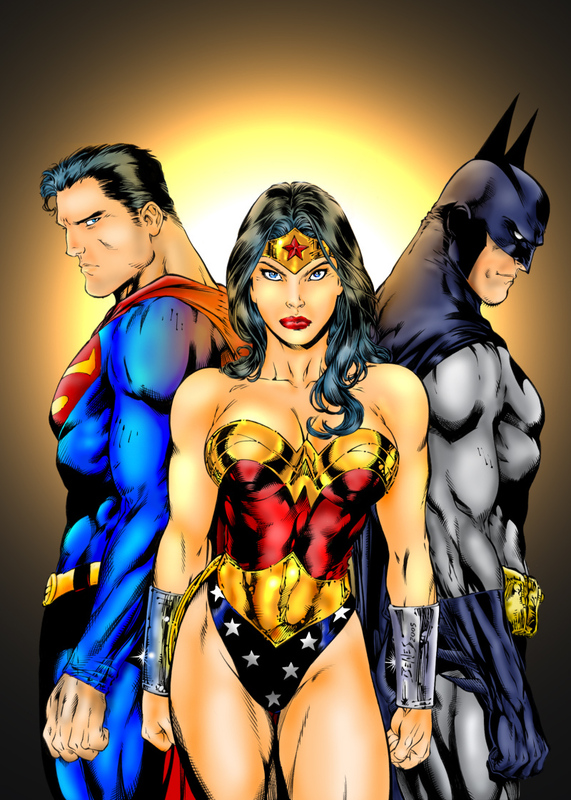 She's an important part of the big DC trio: Superman,Batman and Wonder Woman. Her character deserves a well-done film. For all the crap Joel gets, he at least realized he was making a Batman movie and didn't try to pretend it was something deeper and more profound. I loved the Nolan Batman movies. However without spoiling everything I'll only say that I went in with high expectations and it delivered up until the end. Near the end of the movie it started to p**s me off for reasons I'd have to make a list for. Right now I'm too tired to type it all up. I gotta say, and I say this with no disrespect towards you specifically, but I generally dislike DC. Notably, the only one of this trio here I like is Batman. Some reason Batman has 'registered' with me over the years. Overall, the only thing I dug about Superman was "Smallville" and even that kinda was a huge departure for that character. I generally am a "Marvel' guy. But...Wonder Woman DOES deserve some sort of film or tv project. A lot of the characters in DC are hard to relate to. They're all ridiculously perfect, at least classically, whereas Marvel has long had more flawed and therefore more relatable characters. Batman is just the most "human" of the DC characters - he's clearly somewhat deranged himself, is physically a normal human, has a sad but simple backstory (compare it to Wonder Woman's or Superman's), etc. His villains are also generally more interesting, particularly in their modern incarnations. The animated Batman did wonders for a bunch of them, but even The Shark, who was created in 2005ish, is pretty cool. I will say The Flash can be pretty good (also, his villains are often interesting, similar to Batman's - really liked the one shot story from Captain Cold's POV), and many of the B-lister DC characters are pretty cool - I quite like Jonah Hex, for example. But yeah, I generally like Marvel's characters much more too. I think this is a major reason their movies have much more success. More likable characters.